Father of 2 and a keen tech enthusiast. Whilst family life and work takes up most of my time I like to get my gadget fix by tinkering with my Android or reviewing products/writing articles for LandofDroid.com & BeginnersTech.co.uk as well as my own (unloved blog) techabella.co.uk. For the last couple of years my focus and attention has shifted away from reviewing, testing and dabbling with tech whilst I prioritized on my family and fighting a Cancer diagnosis. I’m firmly out the other-side and after adjuvant chemo-radiotherapy, multiple surgeries, and a further 6 months of Chemotherapy I am now 18 months into remission and keen to jump back into my passion. So keep an eye out for some new posts coming in the New Year… I’ve already got some ideas including some product reviews courtesy of Aukey, use of a VPS to host a remote Plex server, SmartHome setups and many more! Thanks for reading and have a great Christmas! Previously my streaming needs were met by streaming from my NAS to the XBox… But this comes with it’s limitations, mainly the codec support although the standard UPnPUI is pretty basic too. I’ll only go top level here, if you’re interested then I recommend reading more on the Plexapp website. 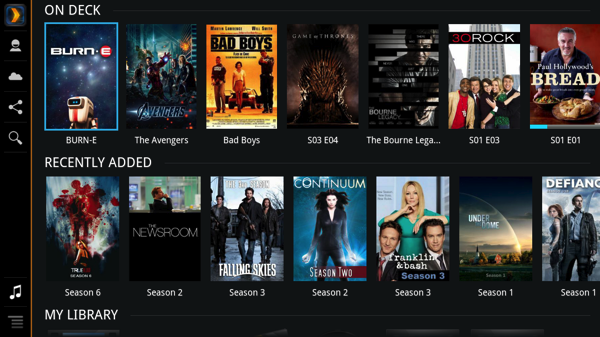 In essence, Plex is a streaming solution based on the popular XBMC platform. It comprises of two parts; Firstly, Server software which sits on the device which is connected to your media and the second piece of software sits on the receiving device and is like the navigation dashboard. What’s really cool is you can set the Plex server software to run on Windows, OS X, Linux & NAS drives. This server software will monitor your folders for changes, and will fetch the metadata for the movies, music, tv shows you have on your drives from the internet and show it as a nice interface for you to choose what you want to watch and see more details about it. It also records what you watched (so you can sort by unwatched) as well as what you last watched so it can recommend the next program in a series to watch, or remember your location so you can restart a film from where you left off. Movies, TV Series, Music etc are all organised into their relative groups and offered as per the above picture, when hovering over an item or selecting it you are presented with more information about the particular item such as synopsis, fan art, actors, year of release, director, quality of the file etc. I really love the interface and functionality. It makes choosing a film to watch so much easier and actually an enjoyable experience, I now just scroll to my unwatched list on the Plex client for the Roku, and then just have a flick to see what I fancy. When I want to put a movie on for my daughter (who’s not so fussed whether she’s seen it or not as she’s only 2), I just scroll to categories and select Family or Animation and then let her pick what she wants to watch. You can easily search by groups of; unwatched, genre, year, director, actor, quality (i.e. SD, 720, 1080 etc), even compilation such as select ‘James Bond’ and all my Bond films show up. TV is similar, you can search the program in a multitude of ways and then it’ll break it down by series… and even fetches the TV theme tune to play when you have it selected. Great touch! I highly recommend anyone take a look at this FREE streaming software (I was so impressed I’ve become a lifetime PlexPass subscriber which gives you a few more features and early release). If you have a device which has your media on, then it’ll most likely work, and you can stream to a multitude of devices from the same PC as the server software is on, to Roku’s, Android phones, IOS, Windows Phone, Windows 8, Google TV and also some smart TV‘s from Sony, LG or Samsung. I also hear they are looking to stream to ChromeCast in the future which is what I’ll probably get when the Roku has to go back. Did I mention this is free software? Why not check it out, from the below link. You have nothing to lose except maybe some time, but I love it and if you have a large unorganised media database this makes it so much easier to navigate around. I’ve only really touched on the base of what Plex can do, there’s so much like automatic synchronisation to mobile devices, transcoding media automatically to work on the device being streamed to, remote play etc. Just have a look, I assure you it’s great! I often help out and regularly read forums and articles about Tasker for Android. One of the things I come across often is people using Tasker profiles to enable/disable GPS when opening specific apps such as Maps, Navigation etc. Or when creating a task set in Tasker with the ‘Get Location’ action to get a fix on the current position. So what are the negatives about leaving GPS disabled? The phone will record the last GPS fix and will use this to make getting a new fix on satellites faster the next time the service is started. 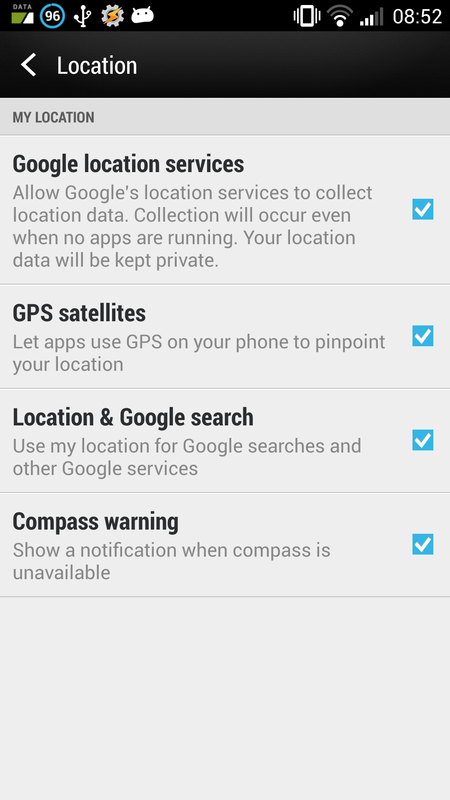 If you disable GPS you’re starting from a cold start and it may take longer to get a positive satellite fix. Don’t be fooled. The GPS service on your Android device is only being used when you see the icon in your notification bar, it’s not always running and draining your battery. Whilst I can’t comment pre-Gingerbread (it’s been so long since I ran a <=Froyo I just can’t remember). However, Gingerbread and JellyBean have all been pretty good at only initializing the GPS process when requested by an app or the system. In effect, what this means is if you keep control of your applications that you know will ask for GPS and limit these then you shouldn’t see much GPS usage at all. I have left GPS enabled for years, and I just maintain within each app whether I want it to have access to my location. So for Facebook & Twitter I have disabled the location services from within the apps themselves. I have 34 apps on my phone which utilise the ‘Precise location (GPS and network-based)’ permission, of which most are weather updates or Google Services which i know do not use GPS but instead the cell based api. Other apps like Endomondo I know uses GPS and I’m happy with that as it only uses it when the app is opened. Tip: You can find apps permissions in ‘Settings-Applications’ and then clicking on the app and scrolling down on the app details page. You can also install an app from the Play Store called Permission Friendly Apps. This app scores your installed apps based on their permissions, it can even filter apps with a particular permission such as the ‘Precise location (GPS and network-based)’ permission. So can you leave GPS enabled? Sure, as long as you are aware of what apps will utilise GPS and keep on top of their settings there is no harm in it. There may be the occasional usage that runs in the background. But in my experience it’s infrequent and only for a short period that it’s more hassle to disable and enable the setting than to just leave it open for use as required. I’ve not noticed a significant drain on battery so I always recommend just leaving it enabled. If you’re running a HTC device on Jellybean then you’ll no doubt have noticed the Power Saver icon remains on your notification panel at all times with no way to remove it. If like me you prefer to have as little on your bar as possible then you may want to check out Jmz Power Saver Disable which will remove the icon all together. Note: this will only run on rooted devices. Android: Why does Google ask me to turn on WiFi for location services? A recent post on Joao Apps AutoLocation FAQ made me realise just how common this question is, and how some people don’t realise why it is asked. So why does Google need WiFi on and doesn’t this cause unnecessary battery drain? I’m going to quote Joao on his FAQ post and share it as it gives a good insight into something which is not necessarily obvious. If you want any kind of reliable location service to work on your device, you’ll have at least a bit of battery drain, there’s no way around that. If any of these conditions are not met, your location may be way off. Obviously this is more tailored to users of his AutoLocation App. However it is still relevant as Google use location awareness for a lot of things in the background of your phone such as weather updates and Google Now cards, as well as passing this data onto other apps like FourSquare, Twitter, Facebook etc. So next time you get this popup and wonder why, hopefully now you’ll know.